Roof algae, lichens and/or moss can eat through your shingles and into your roof deck causing wood rot. 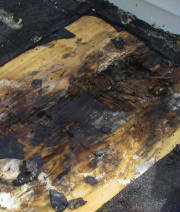 When the wood rots, moisture gets in through the cracks and creates an environment hospitable to mold growth. 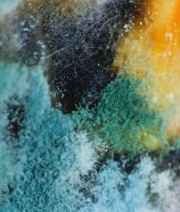 And mold growth in a home can pose health risks to people and pets. Don't ignore roof stains. Contact the authorized Roof Shampoo® contractor in your area. With a gentle, eco-friendly Roof Shampoo®, costly roof repairs can be avoided BEFORE any permanent damage to your roof deck occurs. Clearly, roof stains are serious business. As Dr. Victor Morgenroth explains in the following article, roof stains, roof mold, fungus, algae, lichens, fungi, moss, and mildew can lead to mold growth which can cause health problems. Dr. Morgenroth is a Keys Gate resident who is a semi-retired, adjunct professor of neurology at UM. He was a principal administrator in the Environment Health and Safety Division of the Organization for Economic Cooperation and Development (OECD) for 20 years; prior to that he was a Group Leader in the Toxicology Division at the Center for Food Safety and Nutrition in the US Food and Drug Administration (FDA). Previously, he was on the faculty of several medical schools in neurology, pharmacology and psychiatry. 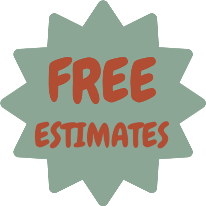 “Having your roof cleaned actually makes sense.... It isn’t just aesthetics. While people like to say that dirty roofs lower a property’s value and may make it hard to sell, the “dirt” on a roof actually shortens its life span and can even present a health hazard. Furthermore, the “dark stains” on a roof act as a sponge to absorb the sun’s heat, which causes a rise in the temperature inside a home or building, creating higher air conditioning bills. The dirt isn’t just dust – It’s alive. Some of the black or very dark roof stains are caused by a resilient type of algae, Gloeocapsa magma (a type of blue-green algae commonly found in climates with warm, humid summers). The algae grow in standing water, as well as in our lakes and ponds. The algal spores are carried to our roofs from the water sources by the wind and birds, and then from roof to roof where it grows and feeds on the limestone filler in asphalt shingles and the real dirt on tile roofs may be in some cases the tiles themselves. Worse still, as the algae grow, they retain water and foster the growth of other roof inhabitants. Fungi normally begin their life cycle as an airborne spore that settles on roofs, especially the asphalt shingle ones. The spores on the northern exposure of the roof stand a better chance of survival because that portion of the roof is the last part to dry after a rain or morning dew. This raises the humidity on the surface of the shingle, thus creating a perfect feeding and breeding ground. The tar used in roofing is fossilized, dead organic matter — and an important food source for fungi. Asphalt, at the granule base, is normally consumed first. Once these granules dislodge, accelerated deterioration will occur. Ceramic granules represent the outer hard shell that protects against hail and other falling debris. Ceramic granules protect against damaging UV radiation and insulate the roof against extreme heat. So you can understand that their dislodgment by the growing fungal colonies can be detrimental to our roofs’ longevity. Surprisingly, the blue-green algae are also food for the fungi. Different mold species can have varying health effects, but it is important to remember that any excessive mold growth needs to be taken care of, regardless of the species. Any excessive mold growth can lead to increased allergies, toxicity, and house/building structural problems. While “sick building syndrome” has been talked about frequently in the media, it isn’t always reported that this syndrome is often caused by faulty or leaking roof assemblies that result in fungal infestations. It isn’t, as reported, always due to chemicals in carpeting. 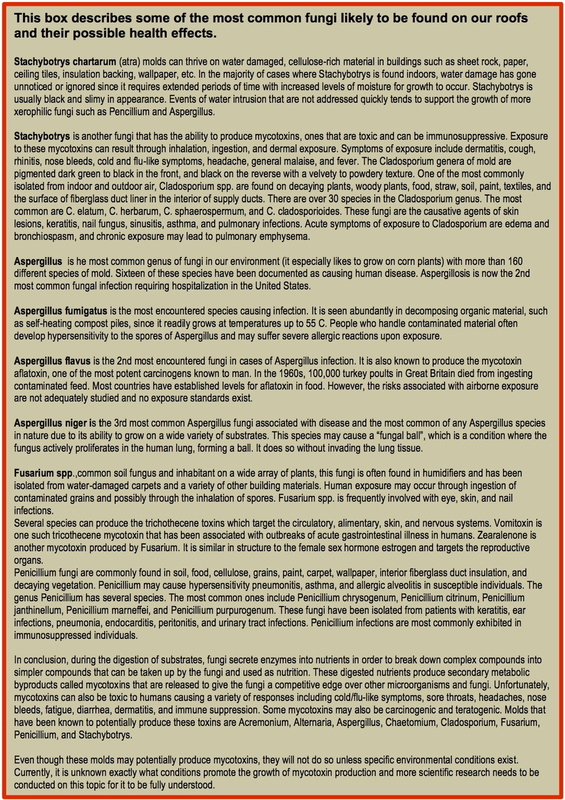 The box below is Dr. Victor Morgenroth's list of common fungi on roofs.